By James Moore, Operations Analyst/Projects Coordinator, BancorpSouth, Inc.
BancorpSouth, Inc. (stock ticker: BXS) is a bank holding company with assets of over $9 billion with branches in Mississippi, Tennessee, Alabama, Texas, Louisiana, and Arkansas. Given our geographical footprint, it is an expensive proposition to provide printed reports generated on our 9672-RB6 OS/390 v2.10 machine to each and every branch in a timely manner. Conversely, we need to get those very reports to every branch the next working day so that our customers can be promptly and properly serviced. I got involved with the JES2Mail software package when I received a request from a branch officer that wanted to receive her reports via email. The project scope was widened when our Vice President focused in on how much paper we were using a year, approximately $64,000 a month worth. We had already been using JES2Mail to some extent to send officer's reports, so he was already aware that we had the technology to deliver Mainframe reports via email as PDF documents. He directed that we would begin using this approach more-and-more in order to cut cost. JES2Mail's robust and easy to implement report splitting and delivery features, along with the high ease-of-use of the Adobe Acrobat Reader client for end-user viewing and printing of documents, has enabled our team to apply this technology to a large number of reports. So far this has resulted in a 38% reduction in paper cost ( a savings of about $24,000 per month), plus an estimated $2000-$3000 per month in shipping cost. The acquisition cost of JES2Mail was about $15,000 and certainly the ROI, based on these savings alone, would please any CFO. However reduction in paper and shipping costs are not the only benefits we have gained using the software. Not only are our reports now being delivered sooner and at a lower cost, but the product is enabling us to add additional features and value for Users. For example, some of our officers were receiving 200-400 pages of reports, daily. Having to sort through this stack of paper to find a specific report for a specific region was time consuming. By utilizing JES2Mail's PDF Outline feature, an officer can now jump almost instantly to the page he or she needs. In another case, a few of our officers wanted new reports to be generated that they could import into Excel. The officers contacted us (Operations) and asked if we could do it. With JES2Mail, we were able to oblige them with almost exactly what they wanted. They have to do an import of a comma-delimited file, but as one pointed out, it sure beats cut-and-paste on a 300+ page report. That officer is now able to bring in his report in 5 minutes, versus an hour of labor-intensive work every Thursday. I can't give a figure, but you can reasonably guess how much 55 minutes or more of a branch president's time is worth. Our programming staff is utilizing JES2Mail as an error-reporting facility. By adding IF-THEN conditionals to their JCL, they can have JES2Mail deliver a notification to themselves, to our departments, or even to Operations when something goes awry. One programmer has even gone so far as to add instructions in the email delivered to Operations on how to fix the error, thus allowing operator(s) to fix a problem without having to incur lost time waiting on the programmer to dial in to correct it. The programmer can also add or remove instructions to reflect changes he makes to his code. I myself am working on a project to use JES2Mail to act as a backup to our online optical document storage. I have high hopes for this project. JES2Mail has proven to be a stable, dependable and fast report delivery tool with high functionality and of ease-of-use for both Operations and End-Users. I highly recommend JES2Mail to any Mainframe shop interested in reducing costs and improving productivity, service, value and ease-of-use related to delivery of Mainframe print content. 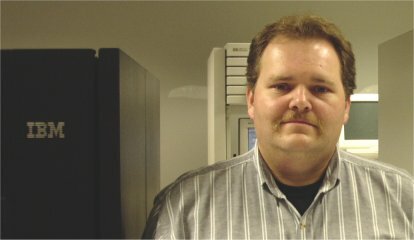 James (Jay) Moore has worked in the IBM Mainframe industry for eleven years, and has worked on a range of computers from PC's to Cray supercomputers. Jay began his career at the University of Mississippi Supercomputer Research Center, working on an Amdahl MVS Mainframe. Jay has been with BancorpSouth for four years.